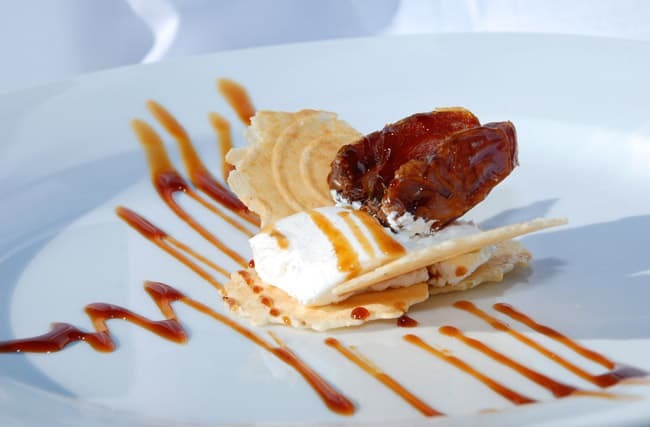 Keffir, Medjool Dates and Sesame Cracker Butterfly with Pomegranate Reduction. 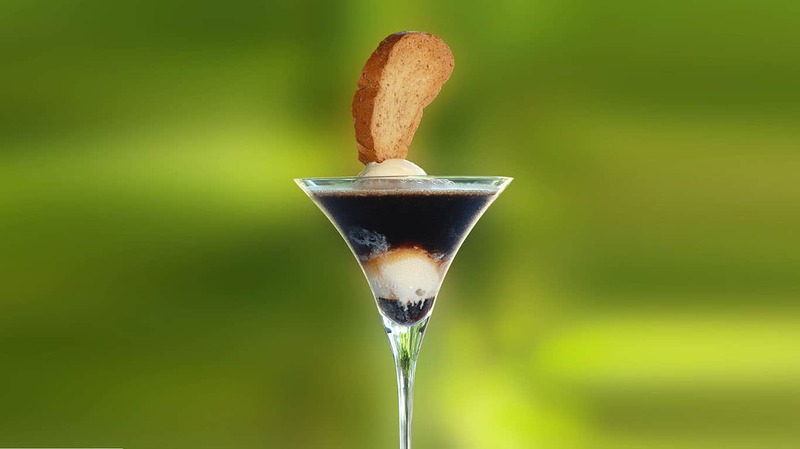 Israeli Stout Float with Vanilla Ice Cream and Tea Rusk is one of Chef Gorji’s savory desserts. In Addition, Gorji’s tomato ice cream smoothie was recently featured in a Zagat article about adult frozen treats in Dallas. 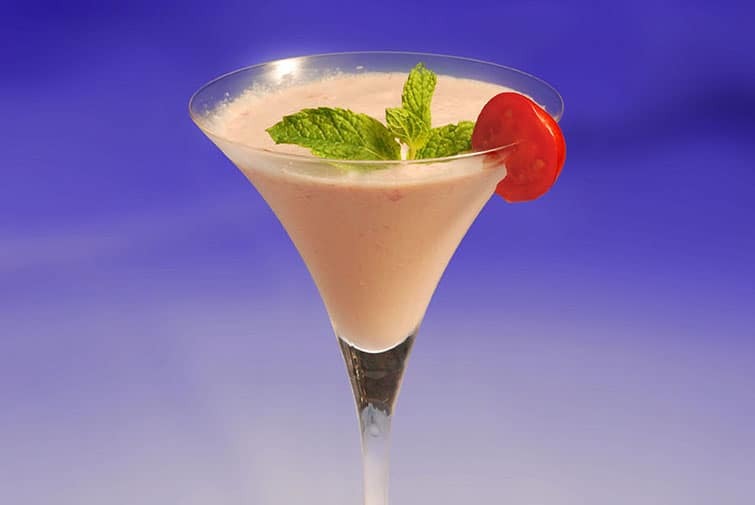 Tomato Ice Cream and Tito Vodka Smoothie. But traditional flavors need not apply.For this unusual—and popular–seasonal concoction, seasonal sweet Texas tomatoes and Tito’s vodka star in this savory adult ice cream dessert. Gorji first introduced this cooling concoction at his upscale restaurant couple years ago. 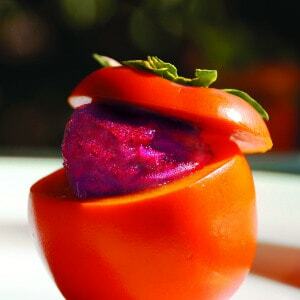 He partnered with Whole Foods, hosting a Three Course Heirloom Dinner incorporating Heirloom tomatoes for every course. The hit of the evening at the creative dinner was the surprising dessert smoothie made with tomatoes. Since then it has become a favorite summer dessert on Canary By Gorji’s menu. GO TEXAN Restaurant Round Up menu 2016 highlighted the smooth, savory libation as the featured dessert. While the tomato season lasted, Canary featured this refreshing Tomato Smoothie on the seasonal dessert menu and it also stars as the third course of his GO TEXAN prix fixe in July. When Gorji can find persimmons in the market, he serves this dessert of ripe persimmon filled with sorbet at Canary By Gorji. 2016’s menu featured Lone Star delicacies such as Texas Quail Legs, Shrimp and Wild Boar. In addition, international award-winning Texas wines round out the offerings. As always North Texas Food Bank and Lena Pope in Fort Worth are the beneficiaries of the annual Restaurant Round Up. No Replies to "Savory Desserts Trend At Canary By Gorji"